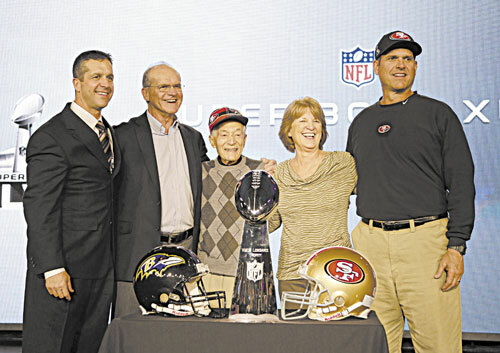 NEW ORLEANS (AP) — Working separately, John and Jim Harbaugh each guided their team to the Super Bowl. They will be on opposite sidelines Sunday, John as head coach of the Baltimore Ravens and Jim with the San Francisco 49ers. Imagine how effective they could be if working together. At their joint news conference Friday, someone asked the brothers if they would consider teaming up if either should be forced out of his current post. Super Bowl tradition dictates that the coaches meet with the media separately two days before the Super Bowl. That custom was altered Friday because, after all, two brothers have never before coached against each other in the Super Bowl. Wearing a dark suit, white shirt, striped tie and laced business shoes, John settled into a director’s chair behind a Ravens helmet. Jim, wearing a 49ers hat, a sweat shirt, khaki pants and running shoes, sat in an identical chair behind a San Francisco helmet. Calling it “an exciting moment,” John ticked off the names of family members in attendance, including his parents. They posed for pictures with grandfather Joe Cipiti on the stage afterward, too. Jack Harbaugh, their father, was a successful college coach. His sons followed in his footsteps, but on different paths. There was one time, however, when the routes nearly merged. The family coaching tree could run even deeper one day. Jim’s son, Jay, works for John as a coaching intern with the Ravens. “He’s far better than we’ve anticipated, and I knew he would be great at what he does,” John said. The brothers obviously had a lot of fun with the situation, joking with each other and sometimes acting like a comedy team. Someone asked them to list their commonalities and philosophical differences. “I would be hard-pressed to spell philosophical right now,” Jim said. “I know he can’t spell commonalities,” John said, not missing a beat. Although Jack Harbaugh has received much of the credit for molding the boys into coaches, the brothers revealed that their mother, Jackie, also had a great deal of influence on their growth into men. Someone asked the brothers whether they considered how they will handle the postgame handshake. Jim Harbaugh enraged Detroit Lions coach Jim Schwartz for giving him a quick handshake and a hard backslap after a 2011 game, but that certainly won’t be an issue Sunday night. “I have not,” Jim confirmed.